Network for Enterprising Women (N.E.W.) is a local organization that empowers Filipinas through entrepreneurship. Since 2006, they have been guiding entrepreneurial Filipinas through workshops and seminars held by some of the country’s notable business gurus, that provide them with the right mindset to develop, start, and sustain a business. Some of the successful members are Roseanne and Robina Ko of Status Hair Salon, Edilee Omoyon of Milea All Organics, and Judith Cinco of Imagere Watch Store, Jen Gerodias- Diaz of Snoe Beauty Inc., Carla Cruz of Franck Provost and Center For Aesthetic Studies, Dr. Mary Jane Torres of Zen Institute, Carrie Rabat of Rieseling Boracay Resort, and Jennifer Tam- Yap of Pure Beauty and MUD. Since 2008, N.E.W. has been staging bazaars to support the organization’s efforts and social initiatives. In 2013, N.E.W has successfully staged The N.E.W. Fashion and Beauty Fair Year 1 at the Rockwell Tent, Makati City. This year, Network for Enterprising Women (N.E.W. ), together with its event partner MBCI, will stage The N.E.W. 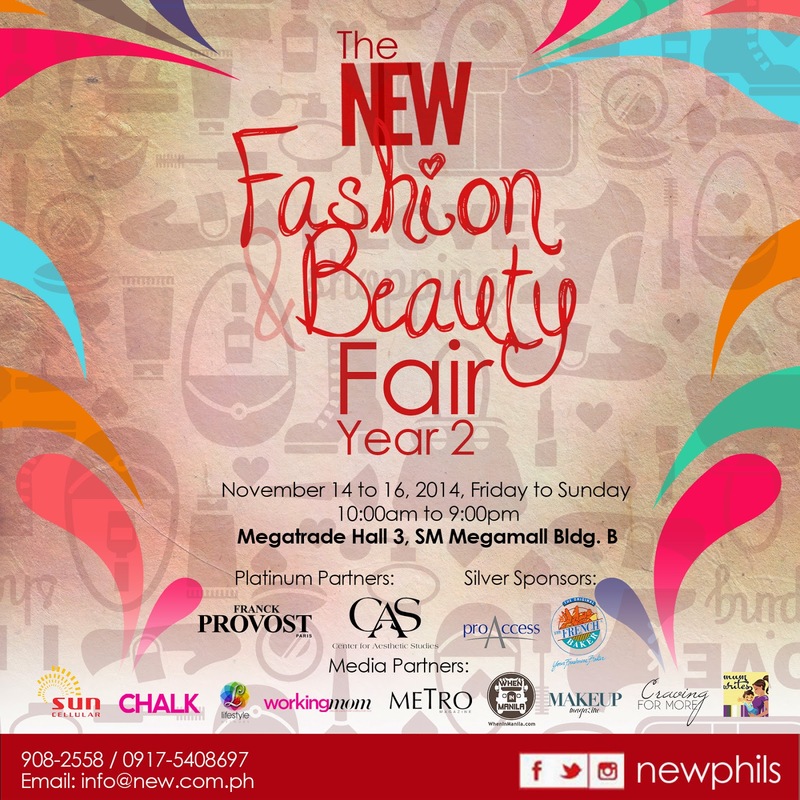 Fashion and Beauty Fair Year 2 on November 14-16, 2014 (Friday to Sunday) at the Megatrade Hall 3, 5/F Bldg. B, SM Megamall. The 3-day sale event will gather the country’s top Fashion, Beauty, and Lifestyle manufacturers and retailers. Aside from the fashion and beauty expo, there will also be talks and makeover demos by notable fashion and image experts such as MAC Cosmetics, and local Fashion Designers and Fashion schools, plus a make-up competition featuring some of the country’s up-and-coming make-up artists. Admission is FREE so gather your friends and family, and shop for the best beauty and fashion finds while helping empower the nation one entrepreneurial Filipina at a time. The three- day event will be covered by Media sponsors: Lifestyle Network, Metro Magazine, Chalk Magazine, and Working Mom. N.E.W. stands for Network for Enterprising Women. We are an organization with a heart to provide a venue for aspiring and existing women entrepreneurs to share their thoughts, their talents, their skills and their experiences towards one goal: SUCCESS! We believe that collective successes can also boost individual success with the practice of right business ethics and a strong support from fellow women entrepreneurs. N.E.W. believes that entrepreneurship is more than knowledge and skills, it is also an emotional venture making women the best candidates for entrepreneurship. For more information,visit NEW’s Facebook fan page and Twitter account. Follow N.E.W. on Instagram (@newphils) and visit their official website to know more about our organization.